Coming in to Friday night, the Salina South Cougar football team was still in search of its first win in 2018. Unfortunately, South left empty handed with a 22-7 loss at Haysville-Campus. Things started out quickly for the Campus Colts on their homecoming night. They scored on their opening series of the game with a 44-yard TD run by Cameron Harvey to make it 6-0 after the failed 2-point conversion. South got the ball midway through the first and was backed up on its own goal line when quarterback, Terran Galloway was sacked in the end-zone for a safety to make 8-0, Campus. South’s defense settled in though. The Cougars began to clamp down on Campus, forcing the Colts in to punts and turnovers on downs. The Cougars got the ball midway through the second quarter and finally got some momentum going when Galloway found wide receiver, Ty Garrett on a 70-yard strike to get South in to a first-and-goal situation. South would cash in two plays later with a five-yard TD run by Galloway and the margin was just one point at halftime, 8-7. South’s defense continued to hold the Colts in check, unfortunately for the Cougars, the Colts’ defense did the same to the Salina South offense. It was still just a one point game midway through the fourth quarter when a Garrett punt was blocked by Campus, allowing the Colts to start at their next drive at the Salina South 12-yard-line. Campus’ Mateo Martinez ran in the next play for a TD to put Campus up 15-7. Salina South had a few more chances to try and tie the game, but the Cougars misfired on all eight of their second half passes. Campus (3-1, 2-1 AVCTL-I) tacked on a late TD pass to put South away for good in the fourth quarter. The Colts snapped 56 total plays alone in the second half, wearing down the Salina South defense. 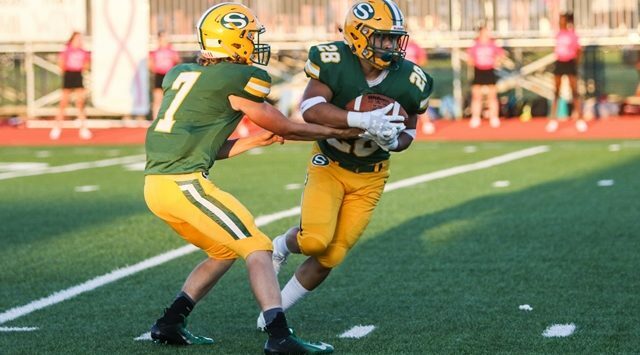 Salina South (0-4, 0-2 AVCTL-I) is off to its worst start since 2016. South was held below 200 total yards of offense yet again, while their defense held Campus to right around 300 yards of offense–however, two plays for the Colts resulted in 100 of their 300 yards. Next up for the Cougars, they play powerhouse and unbeaten Derby (4-0, 2-0 AVCTL-I) on the road next Friday. Kickoff between the Cougars and Panthers is at 7 p.m. on Y93.7.